PDF FILE - CLICK HERE FOR A PRINTABLE WORKSHEET BASED ON THE INFORMATION BELOW. 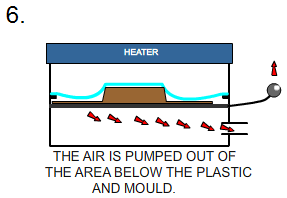 Vacuum forming is a manufacturing technique whereby thin plastic such as high density polystyrene is shaped by heat and force. 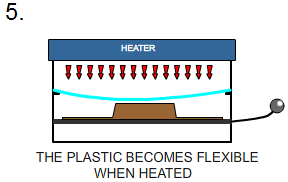 Blister Packaging is manufactured in this way and the basic technique is seen below as an animation. The mobile phone seen below has plain packaging. The back is made from card with a lacquered, gloss finish. The front is manufactured from vacuum formed high density polystyrene. The polystyrene is transparent which means that the mobile phone can be seen through it. This type of packaging is called 'blister packaging'. 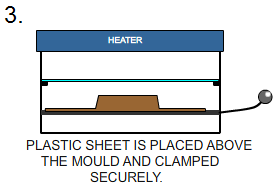 The first stage of vacuum forming is to manufacture a precise mould. This is a skilled job as any imperfections to the mould will show up every time it is used to shape plastic such as high density polystyrene. Bubble wrap is no exception. The mould can be used hundreds and even thousands of times to produce the same plastic part. Each part will be exactly the same. 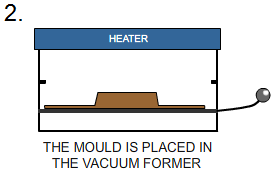 The mould is placed in the vacuum former. It is placed centrally. A sheet of high density polystyrene is paced above the mould and clamped in position. Various thicknesses are available. Usually material 1mm thick is the most suitable for this type of vacuum forming. The heater is turned on. When the machine is being used from ‘cold’ it takes approximately five to ten minutes to warm up to the temperature needed to heat the polystyrene sufficiently. 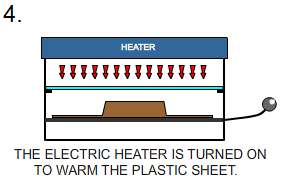 Once warm, polystyrene of this type takes only four or five minutes to heat up before vacuum forming can begin. The plastic (polystyrene becomes pliable and flexible after a short time. It must be very flexible before it can be formed properly. When the polystyrene is ready the shelf is then lifted up towards the polystyrene sheet. The air underneath the former is pumped out and the polystyrene takes the form of the mould.